A Dutch man barely out of his teens is leading one of the most ambitious ocean cleanup efforts ever: to halve the amount of plastic debris floating in the Pacific within a decade. Every year, 8 million tons of plastic are dumped into the oceans. Slat’s plan is to place enormous floating barriers in rotating tidal locations around the globe (called gyres), and let the plastic waste naturally flow into capture. These barriers aren’t nets—sea life gets tangled in those. They’re big, V-shaped buffers anchored by floating booms. 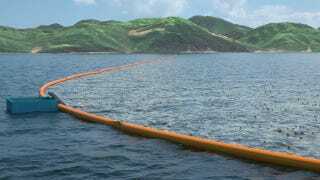 Slat’s nonprofit, the Ocean Cleanup, says the current will flow underneath those booms, where animals will be carried through safely. The buoyant plastic is funneled above and concentrates at the water’s surface along the barriers for easy gathering and disposal. Last month, it was announced that this ocean-cleaning system—which the company says is the world’s first—will be deployed in 2016. They’re planning to station it near the Japanese island of Tsushima, situated in between Japan’s Nagasaki prefecture and South Korea. The detritus-catching apparatus will be 6,500 feet wide and is being called the longest floating structure ever placed in the ocean. Eventually, more of these storm-resistant, plastic-gathering structures will be placed around the world, if all goes according to plan. This August, meanwhile, the Ocean Cleanup is sending 50 vessels to scour the area between Hawaii and California to make the first hi-res map of plastic floating in the Pacific. Slat leads a team of 100 oceanographers, naval engineers, translators, designers, and others. He’s also getting support from key political figures, like the mayor of Tsushima and the mayor of Los Angeles. The Ocean Cleanup started with a crowdfunding campaign last year that raised $2 million. Pretty incredible for a 20-year-old with a big idea.